The Men’s Health quarter box is still kickin’, and they’ve even got a couple of years under their belt. We wondered if its curators have allowed their box to age with beauty, practically, real usefulness, and grace. “For just one dollar a day,” you can do an awful lot of things, like sit at the bus stop, shop Ikea, help impoverished children, stare through the window of a Hugo Boss storefront, or plop that dollar in the piggy bank to store up for a box full of wonders from Men’s Health. As we learned three years ago, each box focuses on every guy’s greatest vices, including something for his fitness, hunger, man closet, and gadget box. And while a number of great subscription boxes do this quite well, Men’s Health consistently delivers the goods, offering a glimpse at new products you may not have seen before. And they do keep these fresh, meaning that every box has a unique edge. In other words, you won’t end the year with three different jump ropes, earbuds, and a dusty box of peanut butter protein bars. Well, we had to open the box, and it did not explode all nice and neat as that photo suggests, but that is an awful lot of stuff, wouldn’t you say? You will be out of pocket about $89 for the privilege, but if you’ve been saving your one-hundred pennies every day as we suggested, it somehow feels like a righteous reward. 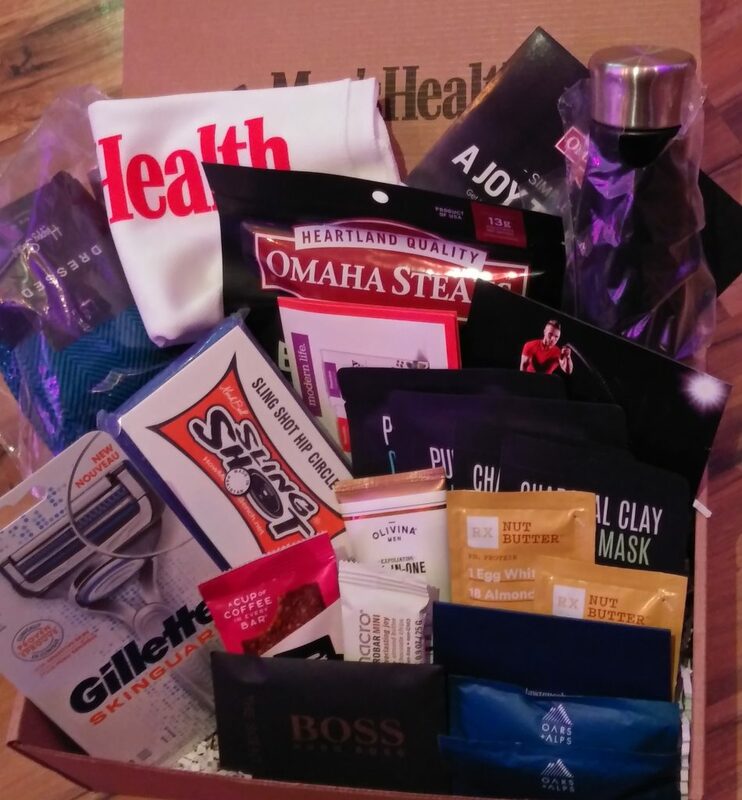 This months box comes with a 3-pack of Happy Socks “dressed”, a Gillette Skinguard razor, Slingshot hip circle, Eat Your Coffee snack bar, Gomacro Macrobar mini, sweat towel, water bottle, Lawrence Hunt gift card ($50), Sample pack of Thrive teas, sample of Hugo Boss “the scent”, RX Nutbutter samples, Soo’Ae purifying black charcoal mask and bubble mask, Omaha steaks beef jerky (2 pack), Olivia Men exfoliating all-in-one scrub, and a couple of Oars + Apps Cool Down wipes. 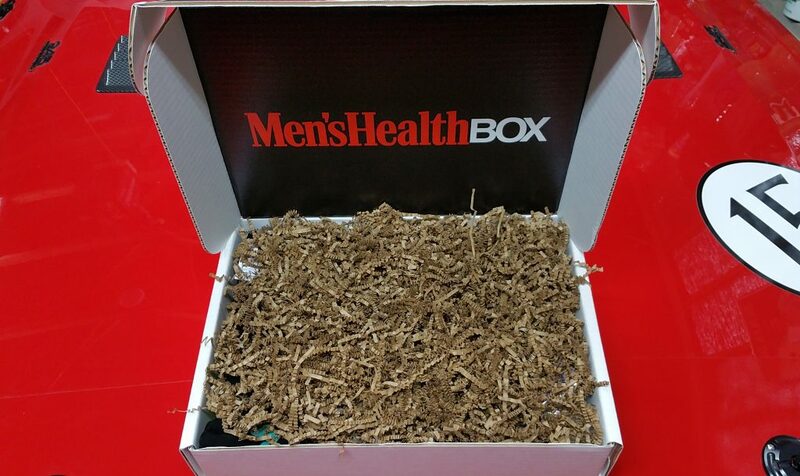 We missed having some ‘gizmo/gadget’ to play with, but this is a nice example of how the curators at Men’s Health are keeping these boxes interesting.